Temper City received some rave reviews, not least from our own publication, but reportedly failed to light a fire under the lunch crowd which restaurateurs need to court in order to stay solvent. It has been almost a year to the day since we first visited Temper City, Neil Rankin’s curry-focused barbecue joint tucked away in Angel Court. 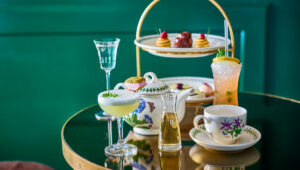 The chef king of carnivores had cooked up a delicious, if slightly surprising concept; open a meat restaurant for a Square Mile known for its consumption of steak, slather it in curry sauce, and dish it up on a thali plate with a giant gin and tonic. Temper City received some rave reviews, not least from our own publication, but reportedly failed to light a fire under the lunch crowd which, given the City astronomic rents, restaurateurs need to court in order to stay solvent. 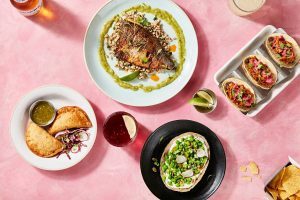 So despite proclaiming the curry menu “one of his favourites”, Rankin decided to ditch it and revert back to the concept that started it all in Soho; whole animal carcasses, grilled or smoked in slabs with South American-inspired spices, sauces and sides. Oh, and mezcal. Lot’s of mezcal. The tacos and tostadas are back, as are Rankin’s tricks with dripping that should be illegal, but while Temper City might have veered into ‘tried-and-tested’ territory, innovative butchery and a fresh focus on fish indicates the Scottish chef has no intention of staying there. For instance, the new menu starts with, of all things, poke bowls, in an obvious attempt to woo that sought-after midday crowd. Time will tell if a raw beef and pear bowl with nori and avocado will woo the business lunchers, but I can’t: we headed straight for the tacos. The storied cheeseburger tacos still deserve their cult status; earthy corn tortillas made on site and filled with a mini beef patty and melted cheese combination to rival most restaurants’ attempt at the real deal. Torched mackerel tostadas, meanwhile, are refreshingly delicate with a decent hit of dill to make their presence felt. 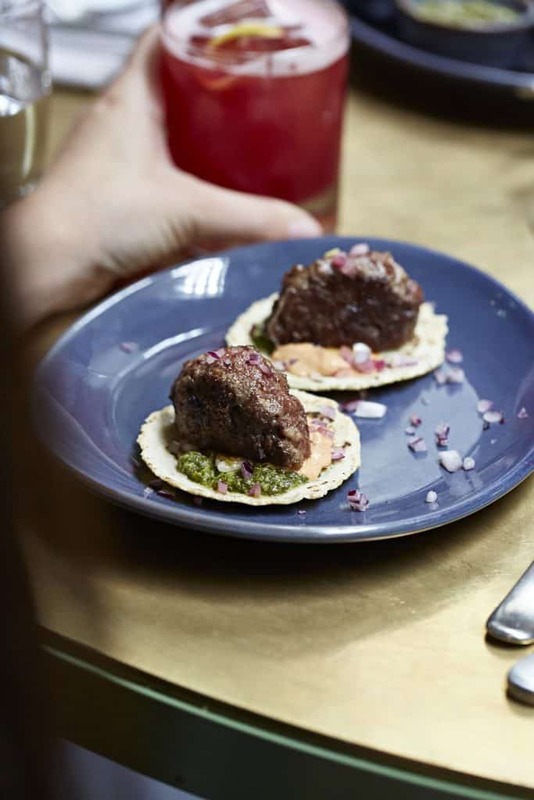 Steaks are served with paratha, salsas, and a simple but brilliant green sauce of lime juice and coriander, but the trimmings barely register, such is the standard of the beef – rare breeds and big, fatty cuts perfectly rendered. 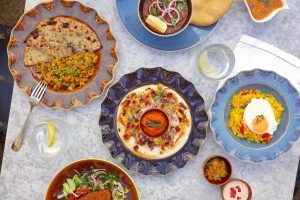 But Temper’s foray into fish is also not the afterthought you might imagine; tender chunks of tandoori sea bass are the lighter option, certainly, but still pack a punch. There is also a barbecue menu – of which beef skewers slathered in kimchi is a standout – and seam-splitting sides like the cheesy mutton poutine that you couldn’t possibly need but should definitely order anyway. Tap out with the vaguely-named but insanely good Bananarama-drama; a relic of Temper City’s curry era that elevates the humble banana fritter to the next level with a deconstructed concoction of sweet meringue and fragrant banana bread. 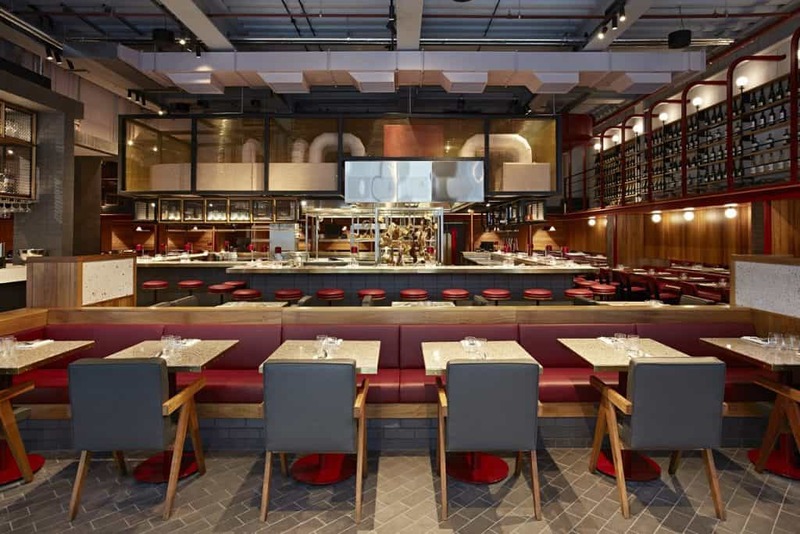 The colossal open kitchen in the middle of the restaurant means you can see chefs slicing, spearing, searing and smoking the various cuts from almost any seat in the house, but the bar is best for getting up close to the action and snaring a few meaty morsels between courses. It is here we learn of the butchery classes currently being trialled in Temper’s meat locker, sample a smokey, slow-cooked chilli that one chef is currently perfecting with leftovers, and enjoy the fruits of a kitchen that is well and truly in its comfort zone, but by no means complacent. Stay tuned.